Following a strong March, sales in the food services and drinking places subsector were down 1.8% in April to $5.8 billion. Lower sales at limited-service (-2.6%) and full-service (-1.9%) restaurants accounted for all of the decrease. Sales were up in the special food services industry group (+1.6%) and drinking places (+2.3%). Colder than normal spring temperatures and an ice storm affecting Central and Eastern Canada may have contributed to decreased sales. Following increases in March, lower sales were reported in eight provinces, led by Ontario (-2.5%), Quebec (-2.0%) and British Columbia (-1.7%). The only increases were in Saskatchewan (+0.9%) and Prince Edward Island (+0.9%). To find out more, consult the dashboard entitled Food Services and Drinking Places Sales. This web application provides access to data on the sales of food services and drinking places for Canada, the provinces and territories. This dynamic application allows users to compare provincial and territorial data with interactive maps and charts. Unadjusted year-over-year sales in the food services and drinking places subsector rose 3.1% in April compared with April 2017. Sales were up in each of the following industry groups: full-service restaurants (+2.8%), limited-service restaurants (+2.7%), special food services (+8.1%) and drinking places (+1.1%). 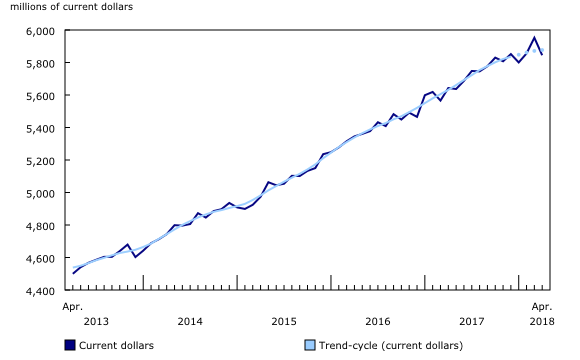 Sales increased in seven provinces, with Ontario (+4.9%), British Columbia (+4.2%) and Quebec (+1.9%) posting the largest gains in dollar terms. Newfoundland and Labrador (-3.2%) reported the largest decline. Prices for food purchased from restaurants were up 4.5% in April compared with April 2017, while prices for alcoholic beverages served in licensed establishments were up 2.2%.